SARATOGA, Calif. – May 24, 2017 MATRIXX Software (http://www.matrixx.com/) today announced that in a recent national survey 58 percent of all mobile users, including those on unlimited plans, would change their mobile service today if they had more choice and control over how they used their data. In fact, if they could choose the best plan to meet their needs in the moment, over 50 percent would change their data plan at least once a month – some as frequently as every day. What’s more, respondents are willing to pay for greater control. Nearly half of all mobile users surveyed agreed to paying 10 percent more for unfettered access without throttled speeds or hidden costs, for only the apps they use most, such as Netflix, Spotify or Facebook. These findings are in stark contrast to the current trends from U.S. wireless carriers, who have each rolled out new, unlimited offerings in 2017. Rather than a one-size-fits-all unlimited plan, three-quarters of survey respondents indicated they would like to personalize a data plan to their own unique needs, or only pay for data they use. Nearly one-third of all respondents say they are not satisfied with their options for buying data from their mobile carrier. Consumers also expressed a desire to better understand just how much data they use Sixty-five percent want better insight into how specific apps contribute to data consumption, with a full quarter of all respondents preferring a data plan they could structure around the apps they use most. Interestingly, over 50 percent of respondents currently on an ‘unlimited’ plan still choose to offload their data use to a Wi-Fi connection because of cost or speed concerns. In summary, the findings of this survey demonstrate that today’s current unlimited data plans are not meeting the needs or interests of mobile users. 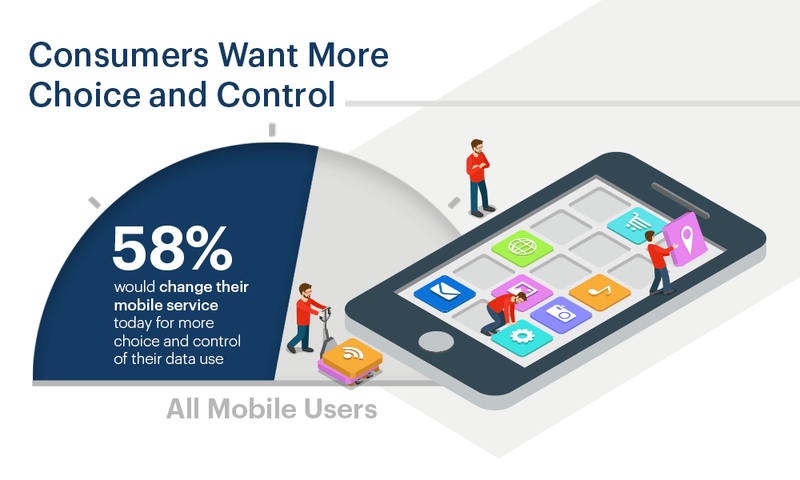 Consumers have indicated what they most want in their mobile service is value on their own terms, which includes choice, transparency and a level of control that allows them to personalize their plan to best fit their unique and immediate needs. MATRIXX Software conducted the survey in May 2017 with 2,288 smartphone users, across the United States, ranging in age from 18 to 70 years old.